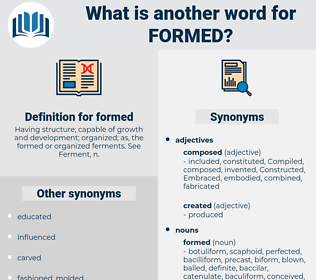 What is another word for formed? Having structure; capable of growth and development; organized; as, the formed or organized ferments. See Ferment, n.
formulation, Performed, reconstituted, Comprising, forces, represented, Organizations, Existed, demonstrated, organisation, organization, Participated, organise, presented, Emerged, Occurred, composed, development, officially, assembled, Drafted, become, Became, organised, Suffered, arranged, Offered, Consisted, contained, accumulated, gathered, received, Encompassed, collected, Remained, Negotiated, completed, Generated, practiced, ascertained, registered, recorded, implemented, identified, es, come, Came, configure, Operated, Appeared, determined, finalized, Convened, instructed, supported, enrol, enrolled, prepared, outlined, configured, maintained, Commenced, Predicated, contracted, reported, inscribed, Corresponded, produced, Indicated, provide, Provided, commissioned, Retrieved, conducted, amassed, Stipulated, initiated, committed, derived, who, expressed, imposed, Contributed, designed, Enshrined, Introduced, Arose, posed, advertised, fed, Submitted, emphasized, Attracted, Rendered, Served, Delivered, specified, Filed, inspired, calculated, mandated, proved, Chose, Amounted, selected, Resulted, co-founded, ruled, Nurtured, Erected, joined, invented, faced, Carried, directed, Issued, defined, concluded, section, entrusted, lf, Entered, requested, struck, executed, opened, engaged, Envisaged, ensured, Worked, utilized, Pertained, pursued, Instituted, lay, Arrived, marked, Installed, held, fell, found, Was, Were, dreamed, Caused, Achieved, Supplied, estimated, started, dropped, Totalled, Relied, elaborated, Brought, Threw, mounted, charged, sur, Returned, signed, settled, included, paved, hosted, licence, Tossed, opinion, laid, showed, Reached, Knew, pointed, Appealed, drew, Enabled, permitted, shall, Began, attended, Looked, sounded, felt, dumped, shot, used, Allowed, Accounted, Assessed, Rode, born, fired, admitted, team, applied, Claimed, accepted, turned, led, painted, learned, Which, Coped, listed, stated, fixed, Asked, raised, placed, Pushed, taught, Happened, Tended, Helped, tried, cast, Visited, broke, Tasked, spent, Waged, Hoped, balled, queued, on, spoke, added, kicked, Fitted, Had, studied, Dealt, Gained, played, handed, paid, Ran, act, Acted, unit, Gave, Took, law, Meant, kept, tied, funded, Met, pulled, named, based, Went, dated, made, 'd, Got, incorporated, Comprised, train, training. formatted, reformed, transformed, Performed, formulated, uniformed, reformulated, reconstituted, represented, manufactored, fostered, re-established, forged, structured, crystallized, restructured, mainstreamed, Administered, Existed, manufactured, partnerships, demonstrated, empowered, Constructed, reestablished, reconfigured, predetermined, retention, Participated, presented, Emerged, Occurred, redrafted, partnership, composed, assembled, Drafted, Engendered, Originated, become, groomed, processed, organised, provoked, producted, Mobilized, fabricated, Inaugurated, accompanied, documented, governed, arranged, Offered, consolidated, Consisted, Compiled, contained, rooted, accumulated, Transferred, gathered, merged, received, endangered, regrouped, summarized, articulated, fashioned, acquired, nominated, collected, conceived, Remained, Negotiated, summarised, completed, Accommodated, Influenced, Generated, ascertained, Denominated, registered, recorded, cultivated, implemented, identified, Embarked, Premised, substantiated, come, Operated, Appeared, determined, synthesized, reshaped, institution, finalized, Convened, embodied, Referred, concentrated, instructed, consumed, prepared, outlined, written, Deployed, furnished, facilitated, Devised, configured, split, qualified, triggered, Worded, Afforded, maintained, Inserted, Exerted, covered, stopped, Predicated, employed, Responded, Obtained, contracted, Engineered, evaluated, prescribed, Grounded, ordained, produced, Aggregated, focused, Attributed, Managed, Provided, accomplished, combined, Emplaced, commissioned, practice, Translated, modeled, Modelled, relaunched, conducted, amassed, Encountered, Undertaken, designated, initiated, committed, affiliated, reflected, carved, described, derived, signified, effected, located, ground, authored, expressed, handmade, grown, imposed, Contributed, Arisen, Purchased, infected, populated, designed, Enshrined, Introduced, broadcast, sustained, chartered, published, posed, compounded, Evolved, Submitted, emphasized, Rendered, rolled, Served, molded, Incurred, donated, advised, Delivered, educated, specified, Filed, Bred, allocated, chosen, integrated, converted, calculated, clustered, recognized, trimmed, subsumed, justified, mandated, proved, proven, experienced, Amounted, Notified, selected, tailored, continued, Resulted, ruled, Caught, invited, joined, invented, Invoked, activated, expanded, elected, Carried, directed, connected, Issued, defined, voiced, concluded, grouped, society, unleashed, owned, embedded, entrusted, driven, endowed, sworn, Emitted, Entered, requested, struck, mission, Anchored, opened, graduated, engaged, Lodged, assigned, torn, Worked, utilized, involved, pursued, realized, Instituted, sought, Arrived, marked, Installed, sat, held, exhausted, found, dedicated, required, warranted, decided, Caused, Achieved, fulfilled, projected, estimated, started, dropped, Aimed, equipped, satisfied, daylight, agreed, knotted, devoted, Relied, attained, entitled, elaborated, Brought, arrested, mounted, earned, Demanded, charged, Returned, signed, announced, divided, settled, sent, included, Shown, Coined, Enacted, known, special, drawn, laid, set-up, Reached, secured, schooled, adopted, Channelled, pointed, Been, Entailed, Deemed, witnessed, Begun, guided, filled, Enabled, Logged, permitted, attended, assumed, intended, Reared, hired, woven, figured, stored, Awarded, Borne, day, used, Allowed, shared, Accounted, Assessed, crafted, left, Bundled, born, tabled, stressed, kid, Chaired, Claimed, Yielded, Housed, released, staffed, turned, led, painted, learned, party, assisted, stated, fixed, accessed, exits, Asked, Pooled, raised, placed, Succeeded, taught, headed, Watched, Happened, granted, Helped, Viewed, fallen, Dialed, cast, Visited, Tasked, spent, changed, posted, crewed, have, heard, Has, bound, queued, Believed, loaded, Passed, added, Fitted, Had, vested, won, Gained, played, run, Acted, unit, seen, linked, owed, Meant, called, kept, closed, tied, funded, Met, seated, named, based, taken, gone, made, Spun, Got, incorporated, shaped, Comprised, training. formless, amorphous, unshaped, unshapen, shapeless. His figure, not above the middle height, is well formed; and his step is at once light and firm. I never saw him before, answered the cook, or rather his lips formed those words.